This superbly animated children's tale is directed by Hayao Miyazaki, one of Japan's most beloved animators. The story follows Satsuke and Mai, two young girls who find their new country home is in a mystical forest inhabited by a menagerie of mystical creatures called Totoros. They befriend O Totoro, the biggest and eldest Totoro, who is also the king of the forest. 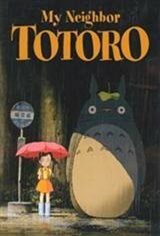 As their girls' mother lies sick in the hospital, O Totoro brings the sisters on a magical adventure but also helps them to understand the realities of life. Like most films released by Miyazaki's Studio Ghibli, this family-oriented feature has a powerful ecological theme.